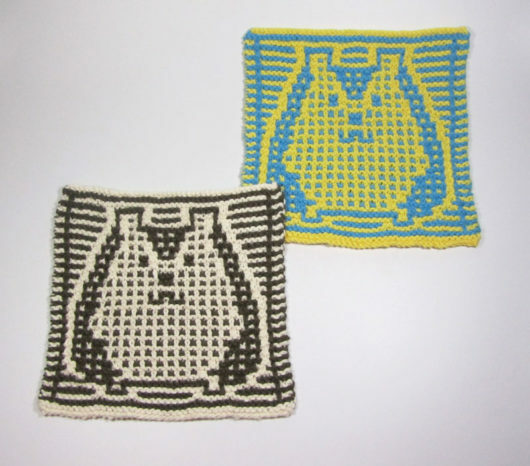 This is Cassandra Bibler’s “Hedgehog Hotpad.” I had a great time knitting these guys and sort of just couldn’t stop. This blue and red set is knit in Knit Picks Dishie. I fairly quickly decided I wanted to try another set, this time in Lily’s Sugar ‘n Cream. They’d likely work as hotpads, as Bibler intends. 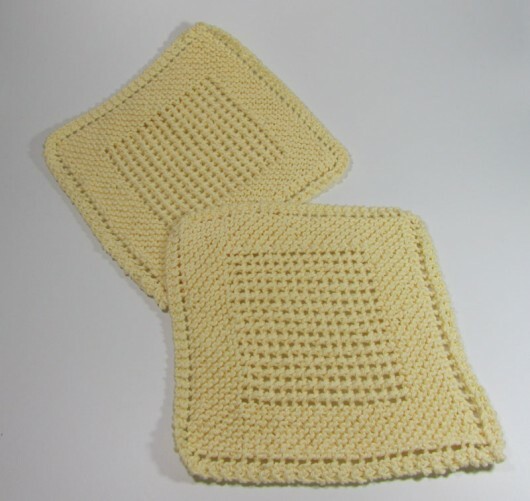 But I gift them just as dishcloths. Two may already be seeing duty as baby body washers. 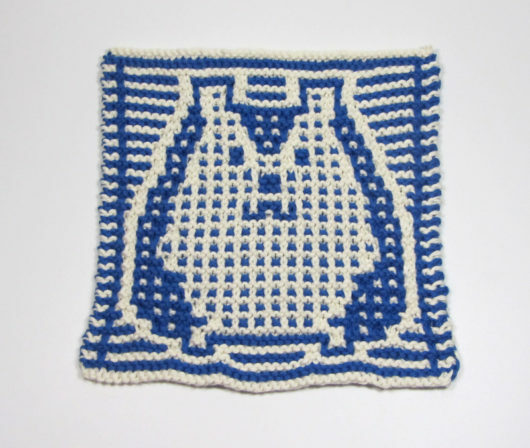 Sometimes these clever mosaic cloths are just what the doctor ordered for a knitter. It’s fun to watch the critter emerge. They knit up quickly. And you end up with a useful item. Plus, in the case of these hedgehogs, they are way cute! The designers of this set, Cindy Abernethy and Rebecca Coday, call it “Pearl Spa Cloths.” Spa Cloths. Pretty fancy lingo. 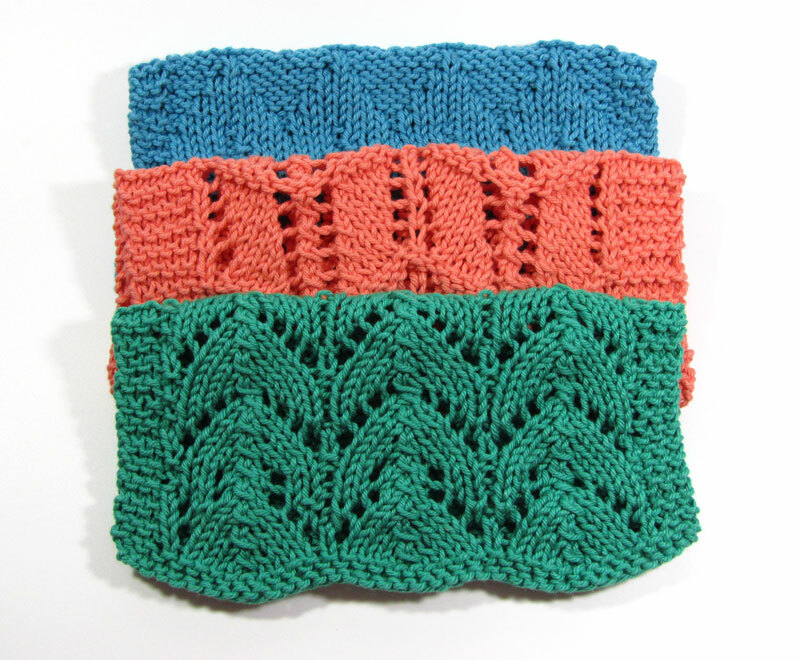 Their patterns were part of the 2014 Rose City Yarn Crawl collection. That was a collaboration of 18 yarn shops in the Portland, Oregon area. The entire collection was briefly offered free on Ravelry. 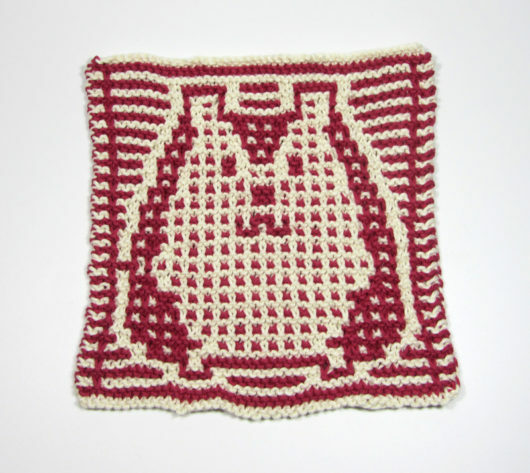 Since then this pattern (at least) has been peeled off and it’s sold on Ravelry. 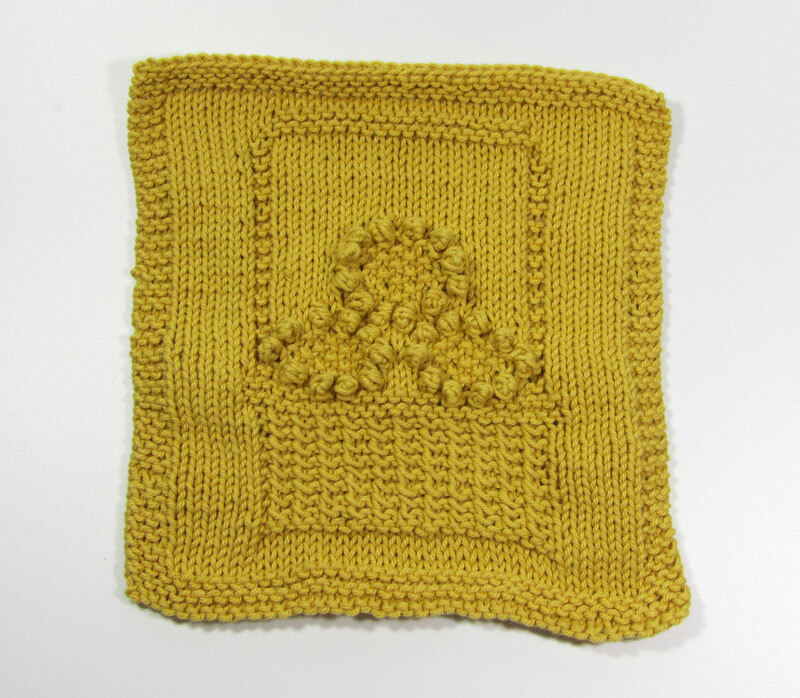 Unfortunately, the patterns were riddled with errors. 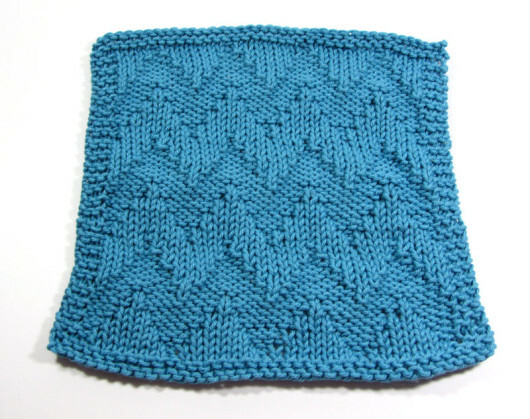 But they’ve been corrected on the Rav pattern page. I assume the PDF being sold has been corrected as well. Difficult to imagine a spa cloth named Horsehoe, but maybe. 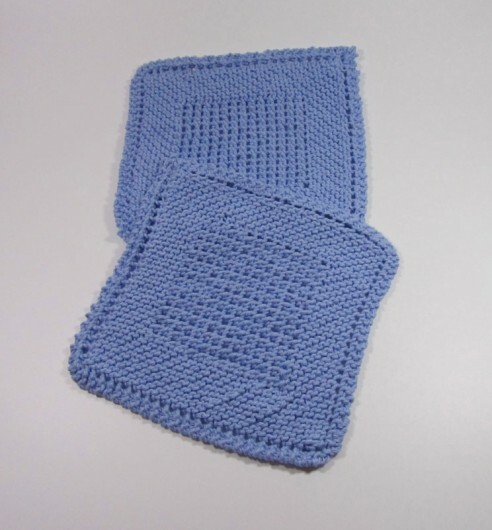 Nice dishcloths. And, yes, if you knit them in organic cotton, or a bunch of natural shades, you could pretend they are spa cloths. 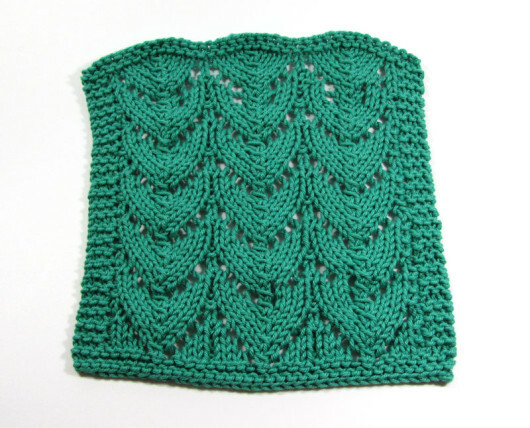 Every once in awhile, the lowly dishcloth calls. This was my last bout of dishclothitus. There was also this one. This one. And this. Some knitters, not me, have been known to poke a bit of fun at dishcloth knitting. I enjoy it. And they do disappear from my holiday pick-your-gifts basket. This recent bout was pretty intense, though. It was my first time knitting with Dishie. Excellent kitchen cotton. 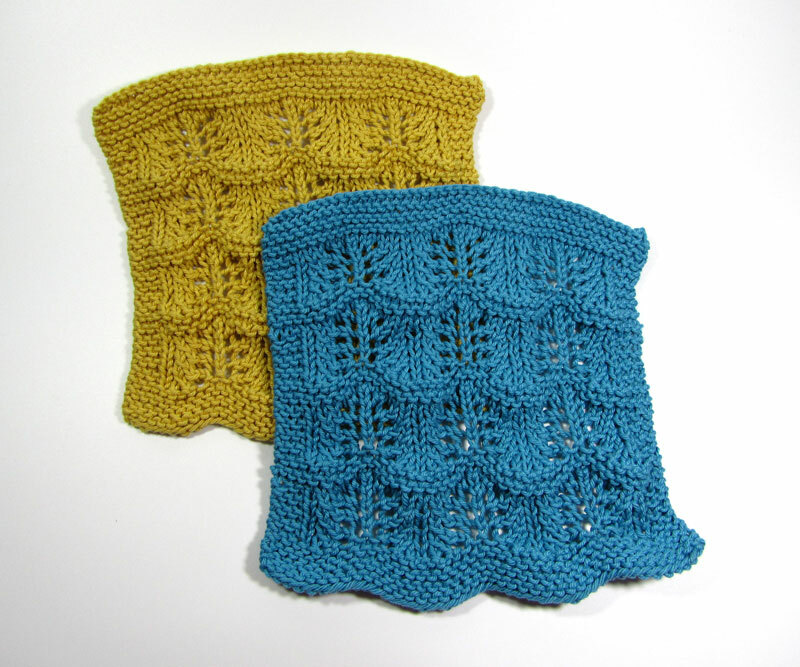 This pair is Deb Buckingham’s “Spring Swatch Cloth.” She doesn’t want to call it a dishcloth either, I guess. 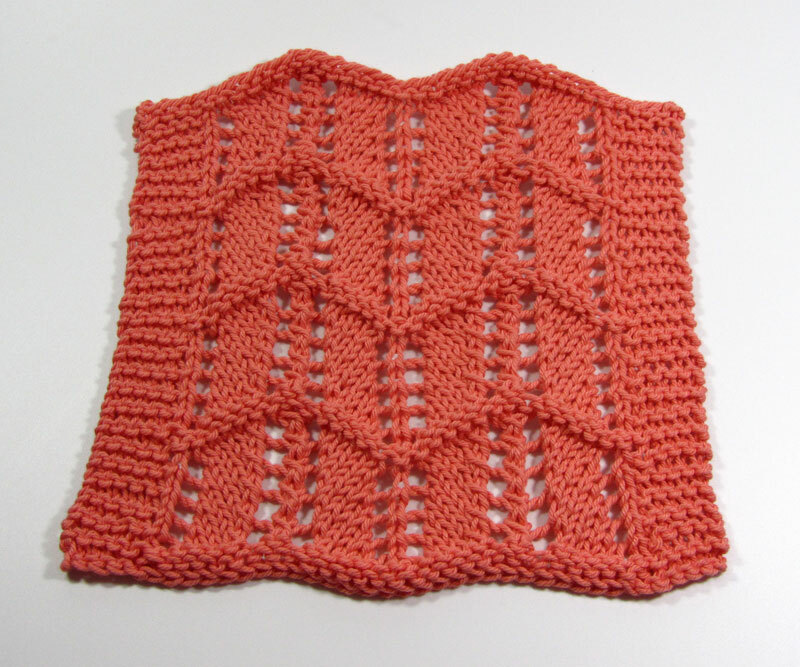 I was gifted a Spring, 2015 copy of the magazine “Love of Knitting” and this pattern is included. It was error-free and quite fun (and quick) to work up. I recently discovered Louise Sarrazin’s patterns. She’s not afraid to call a dishcloth a dishcloth. 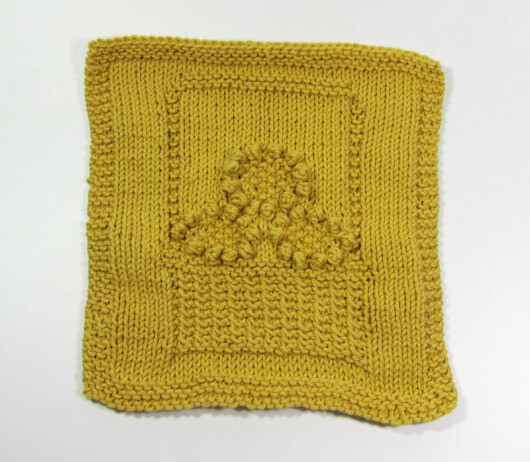 This is the Sunflower Basket Dishcloth, available in Sarrazin’s Ravelry store. C’mon…that’s got to make you smile a tad. It was great fun to knit. 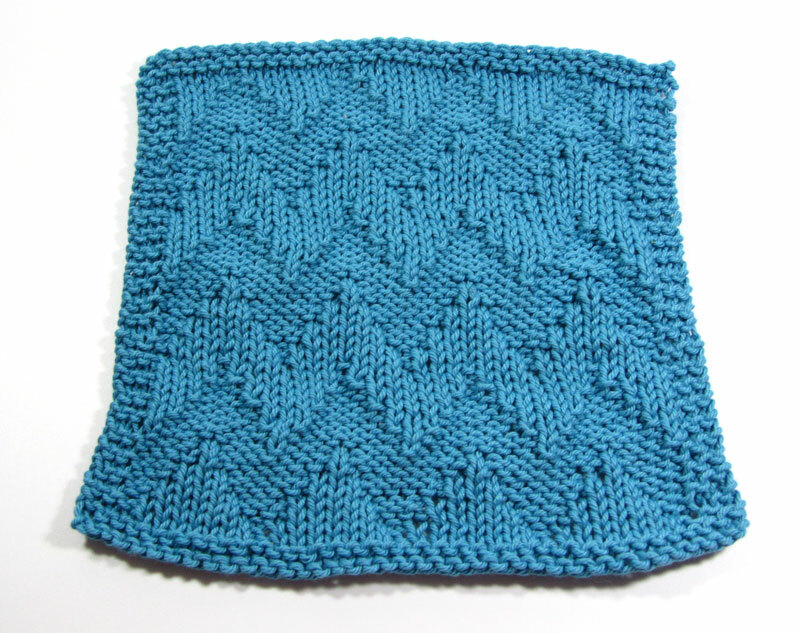 Continuing the Sarrazin (and Dishie) knitting marathon, I tried a picture dishcloth. 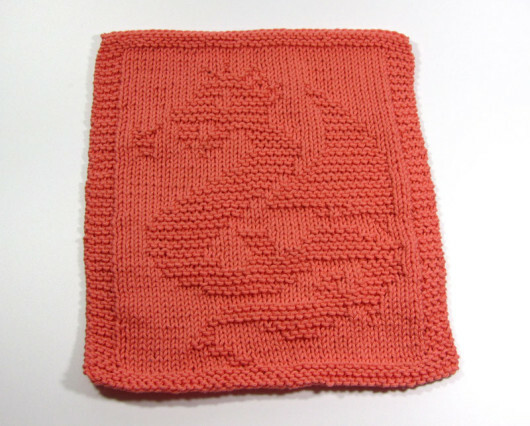 There are a zillion of them on Rav, and this is one of Sarrazin’s free ones: Dragon. Dragon is a large dishcloth, at 45 stitches by 78 rows. I guess the dragon needed room to get that long tail and wing into the picture frame. That little blob near his mouth shows you he’s a fire-breathing dragon, not some dragon who should have covered his nose when he sneezed. 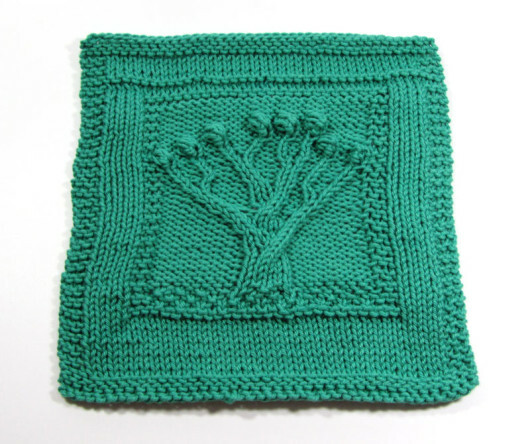 It you’ve always wanted to knit a spectacular Tree of Life afghan, you could start with this pint-sized version and be done in an evening.